Background: The Ketogenic Diet (KD) promotes metabolic changes and optimizes energy metabolism. It is unknown if microRNAs (miRs) are influenced by KD in obese subjects. The screening of circulating miRs was performed with the FDA approved platform n-counter flex and blood biochemical parameters were dosed by ADVIA 1800. Objectives: The aim of this study was to evaluate mir profile under 6 weeks of biphasic KD in obese subjects. We enrolled 36 obese subjects (18 females and 18 males) in stage 1 of Edmonton Obesity Staging System (EOSS) parameter. Result: Any correlation was found between biochemical parameter and three miRs, hsa-let-7b-5p, hsa-miR-143-3p and hsa-miR-504-5p influenced in an equal manner in both sexes. The KD resulted safe and ameliorate both biochemical and anthropometric factors in obese subjects re-collocating them into stage 0 of EOSS parameters. Conclusion: The miRs herein identified under KD might be a useful tool to monitor low carbohydrate nutritional regimens which reflect indirectly the regulatory biochemical mechanisms and cell signaling that orchestrate metabolic and signaling pathways. Keywords: Anthropometric parameters, ketogenic diet program, microRNAs, body weight, obesity, metabolism. Keywords:Anthropometric parameters, ketogenic diet program, microRNAs, body weight, obesity, metabolism. Abstract:Background: The Ketogenic Diet (KD) promotes metabolic changes and optimizes energy metabolism. 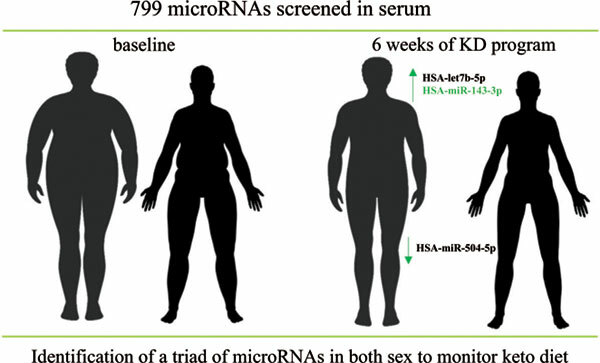 It is unknown if microRNAs (miRs) are influenced by KD in obese subjects. The screening of circulating miRs was performed with the FDA approved platform n-counter flex and blood biochemical parameters were dosed by ADVIA 1800.